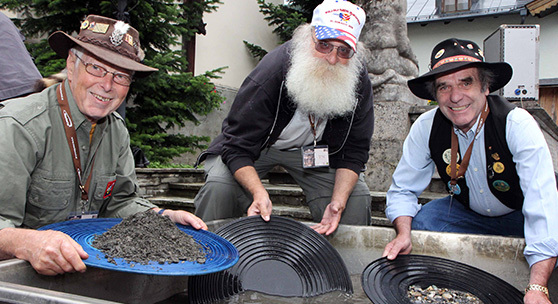 The United States Gold Panning Association is an organization dedicated to all things gold. We exist to provide a clearing house for everyone interested in gold panning, in any way. Click through the links section to find information on other states and countries, and to find equipment for panning. Our focus was in bringing together groups and interested panners with the goal of returning the World Gold Panning Championships back to the United States in 2016. Update: That goal has been realized. Placerville, CA was the spot in September 2016. A perfect place for this is the historic gold country town of Placerville, CA., just a few miles from where gold was discovered by James Marshall in 1848, sparking the California Gold Rush. This wonderful community geared up to make 2016 a memorable event for all participants and spectators. We went to Spain and had a great time panning in the 2015 Championships. The Spanish, and the little town of Navelgas, put on an extraordinary event. Wonderful time, very good contest. We invited everyone to come to the Championships in Placerville, California in 2016. The 2016 World Gold Panning Championships were held in Placerville, CA, in September of 2016. It was a stunning event! Placerville or Bust! Visit the Mother Lode and travel through the beautiful gold mining towns that line the road from Mariposa County to Plumas County. Copyright © 2018 USGPA – All Rights Reserved.